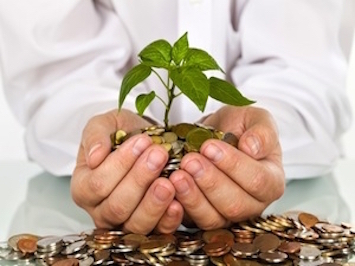 Sustainable investing now represents approximately 11% of the invested assets under management in the US. Some sustainable investors or shareholder activists file shareholder resolutions to influence corporate environmental and social (E+S) policy, and certain E+S proposals have garnered shareholders support levels at or above 30%. ISS recommends “for” about 70% of such proposals, but voting investors appear to diverge from ISS with generally low levels of support on most proposals. Additionally, ISS appears to recommend “for” proposals requesting additional E+S reporting and “against” proposals that would place operational limitations on corporate issuers. Shareholder proposals seeking to require the inclusion of E+S metrics in executive incentive plans are almost always rejected by ISS and the majority of shareholders. Despite the fact that some companies do maintain limited E+S metrics in annual incentive plans, executive incentive programs continue to focus on financial metrics that are direct drivers of shareholder value creation. Sustainable investing – defined as an investment approach that considers environmental, social, and governance (ESG) factors in the selection and management of investments – has seen significant growth in assets under management in the past several years. In the United States, an estimated 11% of total assets under management are now invested based on sustainable investment strategies.1 A large portion of these assets are invested in “exclusionary funds” that create a portfolio expressly excluding companies with operations that are viewed as at odds with the environmental, public health, human rights, or social objectives of the fund. This being said, some sustainable investment funds take a more activist role through the submission of shareholder proposals to the companies in their portfolios. Additionally, some endowments and individual activist investors use shareholder proposals as a bully pulpit for certain issues. Shareholder proposals relating to environmental or social issues represented 33% of all shareholder proposals in 2014, with 31% of such proposals focused on environmental topics and 69% of such proposals focused on social issues (please note that political contributions and lobbying activity are often classified as types of “social” issues by proxy advisors and some investor groups).2 While ESG investors may represent a relative minority of institutional investors, they are clearly active in submitting shareholder proposals. This viewpoint summarizes the trends in environmental and social (E+S) shareholder proposals by examining the most common proposals, the proposals receiving the greatest degree of support, and the influence of proxy advisors on such proposals. We also explore the potential implications for such environmental and social shareholder activism on executive compensation plans. 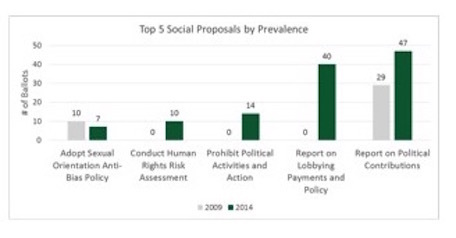 Our analysis of shareholder proposals in 2009 and 2014 shows that investors and activists are increasingly using the proxy statement and annual meeting as platforms for environmental and social activism. While shareholder proposals of a social nature still represent the majority of E+S proposals, the portion of shareholder proposals with environmental aims has doubled in the past five years. The growth of social-focused shareholder proposals can be attributed significantly to proposals that aim to force more detailed disclosure or limitations on how corporate issuers are using their resources to influence the political realm. 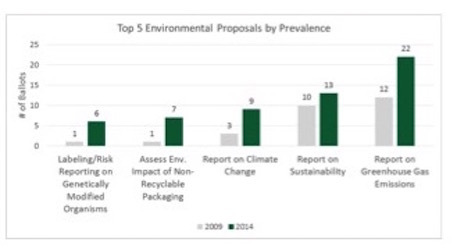 Proposals of this nature are significantly more prevalent than other social-focused proposals. A review of environmental proposal prevalence reveals a similar finding in the request by proponents for enhanced disclosure of company practices. Specifically, requests for additional reporting on climate change and greenhouse gas emissions are the predominant category of environmental proposal. However, when viewing the data on a more granular level, it appears that the incidence of certain proposal categories are sometimes driven significantly by a single investor or associated group of investors with a common activist interest. Therefore, we also examined the level of shareholder support for E+S proposals to provide context on the proposals that are endorsed more broadly by shareholders. Analysis of the most highly supported social shareholder proposals reveals that proposals requesting disclosure of political contribution and lobbying activities and proposals promoting diversity or anti-bias policies garner a significant minority of shareholder support, with endorsement rates at or above 30%. 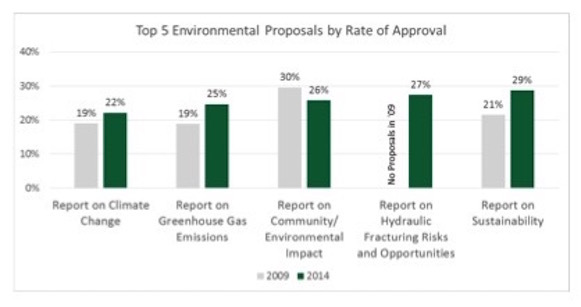 Patterns are similar among environmental shareholder proposals, with strong minority support for proposals requesting reporting on sustainability and hydraulic fracturing opportunities and risks. We do find that ISS is discriminating in the E+S shareholder proposals that it advises shareholders to support. Using ISS’ Voting Analytics database, we found that ISS most often recommended “for” votes in 2014 for proposals requiring additional disclosure. Specifically, ISS supported the following types of proposals most frequently: publication of a human rights risk assessment report, reporting on political contributions, reporting on lobbying payments and policy, reporting on climate change, reporting on greenhouse gas emissions and reduction targets, reporting on sustainability practices, and adoption of sexual orientation anti-bias policies.3 Alternatively, in 2014 ISS commonly recommended “against” votes for proposals calling for restrictions on companies’ operations, including: prohibiting political activities and actions, establishing an environmental/social issue board committee, adopting restrictions on animal testing, and requiring labeling/risk reporting on products containing genetically modified organisms.4 ISS’ support of proposals that request additional reporting, and negative orientation toward proposals that propose to place explicit operational restrictions on the company, shows that the organization is attempting to balance institutional shareholders’ fiduciary imperatives with a desire to encourage social and environmental change through forced disclosure. We note that ISS does not use the same nuanced approach in other areas, such as compensation, where ISS clearly seeks to go beyond additional transparency by attempting to influence the design and implementation of company programs. Despite the low levels of shareholder support for such proposals, a number of companies do maintain environmental and/or social metrics in executive compensation programs, primarily through annual incentive plan scorecards. Such metrics are typically focused on employee diversity or environmental accident prevention, and most often determine 5% to 10% of annual incentive awards for a given year. Corporate social and environmental responsibility (CSR) is of increasing interest to investors as well as public company boards and management teams. Our research confirms that one manifestation of investor interest in CSR is the filing of activist E+S shareholder proposals. We find significant ISS support for most of these proposals, and while many proposals do receive endorsement from a significant minority of shareholders, almost none of these proposals currently pass with majority shareholder support. A very small minority of shareholder resolutions propose to implement E+S incentive metrics within executive compensation programs. Such E+S metrics are not unheard of in public company annual incentive plans, however shareholder proposals to install such metrics into incentive compensation plans are not supported by ISS and have extremely low levels of shareholder support. While some companies do allocate 5% to 10% of annual incentive scorecards to E+S metrics, executive incentive plans continue to link executive incentive payouts to shareholder value by basing the majority of incentive plan payouts on measureable financial outcomes. We expect that E+S shareholder proposals will continue to increase in prevalence and support as social investment funds become more popular and their collective assets under management increase. Our research leads us to believe that the most successful E+S proposals will continue to be those that seek additional transparency rather than those seeking forced prohibitions of certain activities. 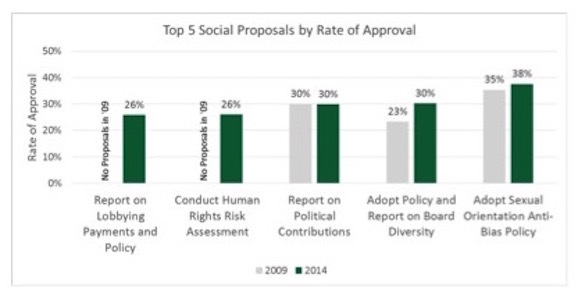 Companies that take a proactive position of transparency through the publication of diversity, political lobbying, human rights, and sustainability reports may be less likely to receive E+S proposals in the future. 1 “2012 Global Sustainable Investment Review." Global Sustainable Investment Alliance. http://gsiareview2012.gsi-alliance.org/pubData/source/Global%20Sustainable%20Investement%20Alliance.pdf. 2 Data provided using ISS’ Voting Analytics database for Russell 3000 companies with annual meetings held between 1/1/2014 to 12/31/2014. 3 Includes proposals with five or more ballots for which ISS recommended “for” votes for at least 75% of ballots. Data from ISS Voting Analytics. 4 Includes proposals with five or more ballots for which ISS recommended “against” votes for at least 75% of ballots. Data from ISS Voting Analytics.